Jeffrey Olsen, 31, took the FDNY entrance test when he was 18 and then had to wait nearly ten years for an opening. It was the job he wanted most, so he waited. Just a couple months before 9/11, Olsen had been decorated for helping rescue five children from an apartment fire. He was also one of several firefighters among the 343 who had donated bone marrow to save the life of a young boy he didn’t know. 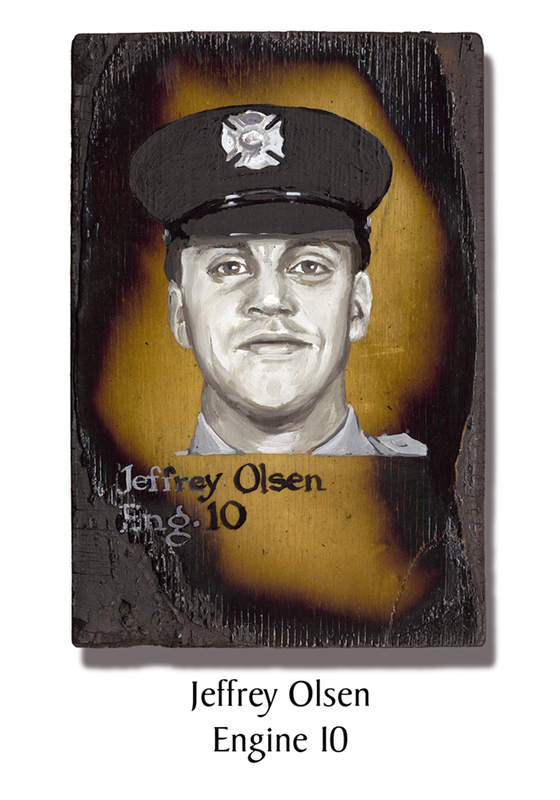 A member of Engine Co, 10, Olsen was detailed to Ladder Co. 10 on 9/11. He was last heard from on the 45th floor of the North Tower. Olsen was devoted to his three children, the youngest just 19-months-old. This entry was posted in Better Angels Stories and tagged 343, 9/11, better angels, Dawn Siebel, FDNY, firefighter, firefighters, firefighters of 9/11, Jeffrey Olsen, LODD, memorial, NFFF, paintings, World Trade Center, WTC. Bookmark the permalink.